This article appeared in Canadian Centres for Teaching Peace. Jump to Feedback. After Mozambique’s civil war, the economy boomed, and the crime rate decreased. President Alberto Joachim Chissano attributed the war’s demise and these other positive trends largely to new human resource technology he called a “new secret weapon.” He and many other military leaders are convinced that these changes occurred from the implementation of this new technology. Surprisingly, the Joint Chiefs of Staff of Mozambique added another duty which involved a human resource-based technology. The Joint Chiefs assured selected military units of the Mozambique Ground, Naval and Air Forces that this radically different approach could unite the national spirit and prevent the civil war from flaring up again. At the same time, the new technology would prevent enemies outside the country from attacking. Even more surprising, the new “weapon” turned out to be a simple meditation technique practiced by groups of soldiers twice daily. In the beginning, conventional military strategists scoffed at the novel strategy. However, today, due to Mozambique’s success on many fronts, other governments may be attracted to the new strategy. The Mozambique military may have harnessed universal laws of nature. The basic principle is seen in physical systems. Certain “internally” coherent systems have the ability to protect themselves against disruptive influences, while “incoherent” systems are easily penetrated by disorder from the outside. One example of such an "invincible shield" is the Meissner Effect (see figure). It takes place at the quantum level of superconductivity. In a superconductor, the coherent functioning of the electrons spontaneously excludes an external, disruptive magnetic field. This system maintains its impenetrable status because no random or chaotic activity can take place within it. Ordinary electrical conductors are not impenetrable because the random activity of incoherent and disordered electrons allows penetration of an external magnetic field. On the left, an external magnetic field penetrates an ordinary conductor whose electrons behave in a chaotic or disorderly way. On the right, the external magnetic field is excluded from the interior of a super-conductor whose electrons function in a coherent collective manner-invincibility. 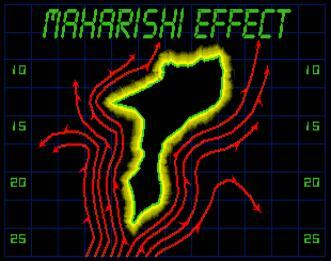 The Maharishi Effect is societal coherence created by Invincible Defense Technology. The Maharishi Effect creates invincible "national armor" that cannot be penetrated by the collective negativity of other countries. Research in theoretical physics during the past decade has led to a progressively more unified understanding of profound and powerful laws of nature, culminating in the recent discovery of completely unified field theories. These theories locate a single field of intelligence at the basis of all matter and force fields in the universe. In this field, all the known fundamental forces of nature (the weak force, the strong force, the electromagnetic force, and gravitation) are unified. Can the Unified Field be Harnessed? Could this field of intelligence be tapped? Modern theorists have long puzzled over consciousness and its relationship to physics. To ancient societies, there was no puzzle: a coherent human mind was able to contact deeper levels of nature-levels that we would now place in the realm of quantum mechanics. Some modern physicists hold that the mind, and/or consciousness, can be located at the quantum mechanical level. If this is correct, then the mind has the ability to connect with more subtle levels of nature. Perhaps this is the secret underlying the technology used by Mozambiques military. Research conducted by nearly 50 investigators representing 17 universities and research institutes indicates the immense power of the collective mind could be used not only to end a conflict, but also to prevent an enemy from arising in the first place. As unusual as this strategy may seem, a similar approach is gaining momentum in health care. Wise health care providers emphasize prevention-oriented strategies because preventing illness from arising is more cost-effective than to dealing with it once it has arisen. Might it be reasonable for any nations military to adopt this strategy to prevent terrorism, war and conflict? The answer now appears to be "yes." Published scientific research indicates that any military can collectively create harmony and orderliness in society. Society exhibits its own collective spirit-which can have varying degrees of orderliness. Compare the American spirit after Pearl Harbor with the lack of it during the Vietnam conflict. Past experience worldwide shows that the spirit of the people is a powerful strategic asset. Over 50 scientific studies indicate that the approach described above can increase orderliness and harmony in society. The results of these tests are too far-reaching to be explained by field effects associated with any of the four basic forces of nature, leading researchers to conclude that they arise from a more profound level-possibly the unified field of all the laws of nature. The specific meditation techniques applied in Mozambique were the Transcendental Meditation (TM) and TM-Sidhi programmes. These simple, natural mental procedures apparently harness the unified fields organizing power. The positive effects of these programmes have been documented in over fifty scientific studies. Many have appeared in leading peer-reviewed journals, such as The Journal of Conflict Resolution, Social Indicators Research, International Journal of Neuroscience, The Journal of Crime and Justice, and The Journal of Mind and Behavior. The TM and TM-Sidhi programmes originate in the ancient Vedic tradition of India. More than five million people worldwide have learned it, including members of all religions and walks of life. Practice of the TM programme does not require changing ones religious beliefs, dress, diet or personal attitude. Over forty years ago, scientist and educator Maharishi Mahesh Yogi, who is responsible for reviving the technique, predicted that a small fraction of the population could improve the quality of life for everyone simply by meditating twice a day. The tremendous strategic advantage that could be gained by implementing a unified field based technology to augment existing defence systems should not be overlooked. Over the years, published studies have documented societal changes due to practice of the TM programme. The changes include: reductions in war deaths and improvements in economic conditions, improved quality of life as well as reductions in crime, violence, accidents, and illness. These changes in social indicators all occurred when the number of meditators reached about 1% of the population in the area under study, whether a city, a province, or a nation. The studies involving participants in the more advanced TM-Sidhi programme showed similar results when only approximately the square root of 1% of the population were practicing the technique together in one place. In the early 1980s, research revealed that coherence-creating groups collectively practicing the TM-Sidhi programme in Israel and other countries reduced the war deaths in Lebanon by 71%, war injuries by 68%, and the level of conflict by 48%, and cooperation among antagonists rose by 66%. This coherence-creating effect was first predicted by Maharishi years before scientific studies came along to support his prediction. He based this prediction on the knowledge contained in the ancient Vedic literature and on discussions with physicists about the coherent effects observed in physical systems such as the laser. Laser light is much more powerful than light emitted from a conventional source. Astronauts on the moon could not see the millions of watts of conventional light illuminating New York City at night. However, they were able to see laser light originating from the earth at levels as low as 15 watts. This is the average energy output of a night-light! Why was the much dimmer 15 watt laser light visible, but the millions of watts originating from whole cities on Earth were not? The coherent light of a laser is different from conventional light. The intensity of normal light is emitted in direct proportion to the number of atoms involved. Excited atoms emit photons while returning to the ground state. This light is emitted at various frequencies in different directions, producing what a physicist would call "incoherent" light, all mixed up. In a laser, however, a type of collective behavior distinguished by its orderliness emerges. The atoms are in perfect correlation with each other and no longer act independently. They operate together as one complete and coherent system. The result is that the intensity of the light emitted by a number of atoms, N, increases tremendously, actually in proportion to N squared. If 100 atoms are perfectly in phase with one another in the laser, they will radiate with an intensity of 100 squared, or 10,000 times that of a single atom. Research indicates that a similar quantum field effect appears to be created in the group during group practice of the TM-Sidhi program. The influence of this coherence radiates from the group to society. A simple analogy can be used to understand this concept. Imagine a large tank of water that is filled with floating corks all at rest. Grasping and bobbing just one of the corks up and down in the water create waves. These waves spread and in turn cause the others corks to start bobbing. The abilities of individuals or groups practicing the Transcendental Meditation and TM-Sidhi techniques to reduce violence and war can be viewed from another perspective. Scientists postulate that every society has a collective consciousness. This collective consciousness is the sum of all the influences created by the individual members of that society. This collective consciousness, in turn, affects the thoughts and feelings of those same individuals. If the collective consciousness is turbulent and stressed, full of tension and fear, then disorder is liable to erupt in violence and warfare. Social injustice and unfavorable economic conditions thrive in disorderly environments. Religious, territorial, political and cultural differences are seized upon and used to further contribute to unrest. Thus the frustrated and dissatisfied population of any country contributes to its instability and disorder. Therefore, the build-up of friction in the nation becomes dangerous to its sovereignty, producing an unstable government that is more prone to war. Disorder can take the form of civil strife or of tension and conflict with neighboring countries. If a war between two nations, a civil war, or even a coup d’état, occurs, other groups or nations can exacerbate the situation as they take advantage of the situation. The reign of terror in France in the 1790s and Germany in the 1930s are among many historical examples of collective stress driving social disorder and spilling out into other nations. Concern over such disorder in their country prompted Mozambique’s military leaders to deploy their secret weapon. They were trailblazers who applied this human-resource technology to increase coherence in the collective consciousness in their country. Obviously, this approach has not been widely accepted in military circles. Even though defensive radar systems routinely radiate electromagnetic waves over a hundred miles, the idea that human mind could have a similar effect-at-a-distance and could be used to create a defence system is novel. Many defence strategists see the mind and brain as the same. Consciousness is viewed as being trapped inside the head. The possibility that the proper collective use of the human minds of our military personnel could create a much more powerful and profound field effect has not been widely explored. This is a revolutionary concept. But so were the ideas for many other aspects of our defence systems that are now considered vital. For instance, although the breech-loading rifle was far superior to muzzle loaders, it took years for armies to adopt. Even more extreme is the example of airpower. Few leaders thought that Billy Mitchell would bomb and sink mighty battleships with flimsy flying machines made out of wood, cloth, and baling wire. Military history has shown that new scientific technologies can give a strategic advantage, even at a distance. We need only look to the radar "shield" deployed in England during World War II. It maximized the fighting power of the under-sized Royal Air Force. Many of todays "tried and proven" technologies were yesterdays pipe dreams. Mozambique may have secured a prominent place in military history. After the programme was underway in 1993, positive trends were noticed. Peace was maintained. Crime, which is normally expected to increase at the end of a war, actually decreased, as predicted by Maharishi Effect scientists. The next year, the military began to be demobilized. Lt. General Tobias Dai, then Commander of the Armed Forces (now the Defence Minister), noticed a sudden change. "What is very clear is that once the positive effect is created, if group practice is stopped, the previous tendencies of higher collective stress, as determined from the crime indexes and the tense situations in the country, began to rise again. In 1994, there was a remarkable decrease in coherence in the country as a result of decreased participation in the group practice of the Transcendental Meditation and TM-Sidhi Programme…"
Dai attributed the dip in coherence to the demobilization of the troops and anticipated ending of TM courses for future police officers. Dai also said in 1994 that "until now, although with several difficulties, the maintenance of peace has been possible during these 2 years, and free and just elections have been carried out…" Coherence-creating groups of meditators were re-created. A year later, the US National Defence council dropped Mozambique from the list of conflicts in the world, and stability has since been sustained. Perhaps it will not be long before Mozambique’s military leaders are ranked along with other pioneers such as the Italian airpower advocate Giulio Douhet. General Douhets strategy still applies today: "Victory smiles upon those who anticipate the change in the character of war, not upon those who wait to adapt themselves after the changes occur." In the tradition of military pioneers, the militaries of other African countries could conduct their own coherence-creating groups which could hasten the progress of another dream–the prevention of terrorism, war and conflict. Sometimes major discoveries take time to be fully accepted and used. Nevertheless, these examples in human history should be a lesson so as to avoid committing new mistakes. Let us recall that history is made by those who, in life, think beyond their contemporaries." The coherence-creating effects of this novel technology and its ability to reduce collective stress could easily be tested by other military research institutions. Such an experiment would be conducted by creating more "Prevention Wings of the Military" in Africa. Research indicates that the effect of introducing a coherent system of this magnitude would be enough to significantly reduce the collective stress in Africa. The post-USSR world has proven to be a more dangerous place than one might have imagined. There are no well-defined opponents. Nuclear weapons from the former Soviet arsenal and other weapons of mass destruction are allegedly available on the black market. No other military strategy effectively copes with the possibility of even one weapon winding up in the wrong hands. The terrorist attacks of September 11th and recent anthrax scare in the United States prove that no nation is safe. New defense technologies must be continually evaluated and deployed to deal with such threats. The human resource-based technology outlined above has been successfully field-tested. Prevention Wings of the Military can be deployed quickly, and inexpensively, and deliver quantifiable results. Warriors since ancient Chinese General Sun Tzu have championed the idea of winning without fighting. In his famous treatise The Art of War, Sun Tzu said: "To fight and conquer in all your battles is not supreme excellence; supreme excellence consists of breaking the enemy’s resistance without fighting." What the ancients called a clever fighter is one who not only wins, but excels in winning with ease. He wins his battles by making no mistakes. Making no mistakes is what establishes the certainty of victory, for it means conquering an enemy that is already defeated. Following the successes of Mozambique’s "Prevention Wing of the Military," more countries may soon apply this strategy to create the highest ideal of military service: Invincibility without harm for military personnel or the nation; and lasting peace for the world-victory before war. Kurt W. Kleinschnitz, received his Ph.D. in Physics at Maharishi University of Management. He is completing a research program to develop an EEG-based indicator for the Maharishi Effect, the effect of increased orderliness in society, (e.g., reduction of war, conflict, crime, accidents, disease, etc., and improvement in economic trends) resulting for the group practice of the Transcendental Meditation and TM-Sidhi programs. He plans to use this indicator in a research program investigating the physics of this phenomenon, and the field-like nature of human consciousness. Kurt is a six-year veteran of the US Navy. Kenneth G. Walton, received his Ph.D. in Molecular Biology at Vanderbilt University. He completed postdoctoral training in neurochemistry at Yale University psychobiology at Massachusetts General Hospital and Harvard Medical School. He is currently Director of the Neurochemistry Laboratory at Maharishi University of Management, where he conducts a multifaceted research program on the neurochemistry of psychological states in relation to crime, substance abuse, and health. Ensign Daniel K. Burke, USNR, earned his B.A. in the Science of Creative Intelligence and M.A. in Professional Writing at Maharishi University of Management. He is a combat veteran of U.S. Navy SEAL Teams with over 16 years of service, and recently retired (2006) as a member of Navy Reserves SEAL Team Eight. He has organized introductory lectures on the applied benefits of this research for several US military commands. Susan Vegors, earned her Ph.D. in Cognitive Psychophysiology at Maharishi University of Management in Fairfield, Iowa, USA. Her research interests are mind-body interaction and the location of the mind in physical creation. "This work…deserves the most serious consideration." "The claim can be plausibly made that the potential impact of this research exceeds that of any other ongoing social or psychological research program. The research has survived a broader array of statistical tests than most research in the field of conflict resolution. I think this work, and the theory that informs it, deserve the most serious consideration by academics and policy makers alike." "We have to take these studies seriously." "In the studies that I have examined on the impact of the Maharishi Effect [Invincible Defense Technology] on conflict, I can find no methodological flaws, and the findings have been consistent across a large number of replications in many different geographical and conflictual situations. As unlikely as the premise may sound, I think we have to take these studies seriously." "The hypothesis definitely raised some eyebrows among our reviewers. But the statistical work is sound. The numbers are there. When you can statistically control for as many variables as these studies do, it makes the results much more convincing. This evidence indicates that we now have a new technology to generate peace in the world." "It is a non-traditional conception, but the straightforward evidence gives the theory credence in my eyes." "An impressive, statistically significant correlation." "The data show an impressive, statistically significant correlation: a decrease in violent crime for the time period over which the group meditated. An impressive number of variables were considered in analyzing the data, and I am satisfied that the research team made a serious effort to examine the data in the light of numerous other possible influences." "A new paradigm of viewing crime and violence." "I want to express my support for this research. What we really are looking at here I think is a new paradigm of viewing crime and violence, and the new paradigm says, look to the individual acting in concert with other individuals to reduce crime constructively. . . . Having worked extensively on social problems in the District of Columbia for some 24 years at the University of District of Columbia . . . I’d like to encourage taking this new idea very seriously. . . . I would like to recommend that this new model that is being offered and advanced here, after a number of exhaustive and very carefully controlled studies, be considered, and that we think about ways that it might be implemented in the inner city with youth and community people who live there." "Sound results which demand serious interest"
"I was initially skeptical, but having studied the research completed to date, I have concluded that these studies on the Maharishi Effect [Invincible Defense Technology] have subjected theory to proper empirical tests. They have shown sound results which demand serious interest. This method should be applied more widely in programs to reduce crime." "I have been following the research on the Maharishi Effect [Invincible Defense Technology] as it has developed over the last twenty years. There is now a strong and coherent body of evidence showing that [this approach] provides a simple and cost-effective solution to many of the social problems we face today. This research and its conclusions are so strong, that it demands action from those responsible for government policy." This entry was posted on Monday, May 23rd, 2011 at 2:10 pm	and is filed under Articles. Both comments and pings are currently closed.